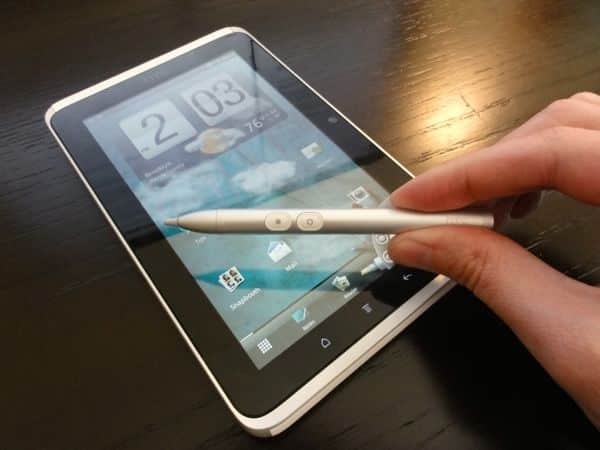 A tablet with a stylus? How … well, 2005, right? Maybe so, but the stylus that comes with the HTC Flyer packs in a few unexpected delights. The seven-inch, Android 2.3 “Gingerbread”-powered Flyer ($499, available now from Best Buy) will work perfectly fine without a stylus, by the way—and I should note that the optional stylus itself is an extra $80, so we’re not exactly talking cheap here. But if you’re willing to pony up the extra cash, you’ll be in for a treat. Just take the aluminum-clad stylus and tap its pressure-sensitive tip on the little pen icon just below the screen; once you do, a little bubble will appear in the bottom corner of the display. Jutting out the edge of the bubble are a series of pencils, pens, markers and highlighters; just tap the one you want to write with and start scribbling away. You can also choose a different color, hide or trash your doodles, or undo any goofs. Done drawing? Tap the menu button to share your sketches via Bluetooth, Facebook, Flickr, Twitter, Picasa, or good ol’ fashioned email. Check out the pictures below to see the Flyer’s stylus in action.